The practice of faculty relying on bundled textbooks and, specifically, access-code materials to provide course problem sets, quizzes, tests and case studies, has wreaked havoc with student efforts to find cheaper textbook alternatives. According to a new report from the Student PIRGs, among a sample group of schools, 45 percent of these supplemental resources were unavailable from any source other than the campus bookstore. As the report's authors noted, the use of those bundles, which exist behind paywalls, eliminates the ability of students to "shop around" — which means they're "forced to pay full price for these materials." They also can't resell their textbooks because the access codes typically have expiration dates. Student PIRGs is an offshoot of U.S. PIRG, a nonprofit consumer advocacy group, which in 2004 launched a "Make Textbooks Affordable" campaign. The latest research project examined 40 public and private nonprofit two-year and four-year colleges. Based on institutional research data, the organization identified the 10 courses taken most often across all of those schools. These "core" courses were then cross-referenced with their required class materials. Nationally, students spent an average of $153 per course in the study; that would drop to $92 per course if they chose the least expensive option. In places where the course bundles were unique to the campus, the average price at the bookstore was $157. When students could buy the bundles in other places, such as online, the average price at the bookstore was $162 — but students could cut 23 percent off the cost by buying the material on Amazon. In classes that didn't use bundles, the average price was $134, but the savings were better, since students could shop for a used book option. 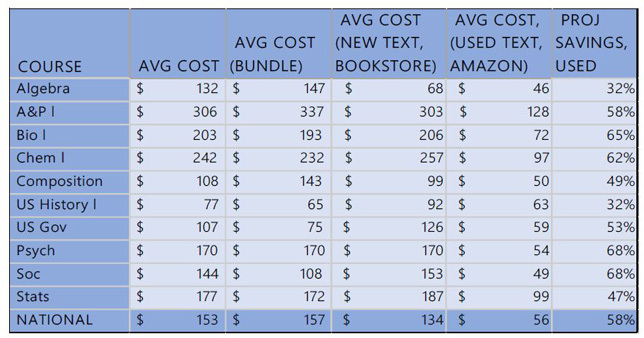 The cost of new bundled textbooks vs. new and used unbundled textbooks. Source: "Open 101: An Action Plan for Affordable Textbooks" by Student PIRGs. Those schools that have invested in open educational resources, the researchers found, generated "significant savings" for students. As one example, Greenfield Community College in Massachusetts used OER in three of six core courses, which cost students "as little as" $31 per course compared to a national average of $153. Greenfield runs a competitive grant program to support faculty as they transition their courses to OER. The project concluded that a switch to OER in the 10 introductory courses assessed at the 40 schools covered in the study would result in a savings of $13 million in one semester. Extrapolating that across all colleges and universities in the country, the savings would be $1.5 billion per year in course material costs. As the report pointed out, all of these subjects have OER curriculum available from OpenStax or other open textbook producers. For comparison, the report included listings of each subject and the textbooks used across the colleges in the sample. For example, the elementary statistics course includes four publishers' options. On the upper end is Elementary Statistics with Excel, used at Aurora University. The cost at the bookstore there was $240.95. On the low end, a suggested open alternative was OpenIntro Statistics with MyOpenMath online courseware, available for free digital download. The report also offered recommendations: Students are encouraged to promote the concept of affordable textbooks on their campuses and work with student government to pass resolutions calling for an OER grant program. Faculty are urged to check out the numerous OER repositories, including Open Textbook Library and the OER Commons, to find inexpensive options for their courses. "With open educational resources, there are no access codes and students never lose access to their core content," said Nicole Finkbeiner, associate director of institutional relations for OpenStax, which is based at Rice University. "This enables students to continue to use and refer to their core content as they move forward in their studies, when studying for advancement exams, and in their professional lives, without any additional costs or barriers." 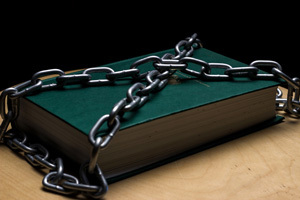 "Publishers' prices can change, while open access material will always be free," added Kaitlyn Vitez, higher education advocate for U.S. PIRG. "We need to ensure that students pay less to succeed and stay in college after they've worked so hard to get there." The report is openly available under a Creative Commons license on the Student PIRGs website.